The cleanliness of the bathrooms in your retail store is important. Will the condition of your bathrooms put your retail store out of business? Probably not. However, the effects of a clean restroom should not be understated. If a customer walks into your store, heads to the bathroom, and sees a deplorable mess, the chance of them not making a purchase and not coming back is certainly increased. Why risk it? 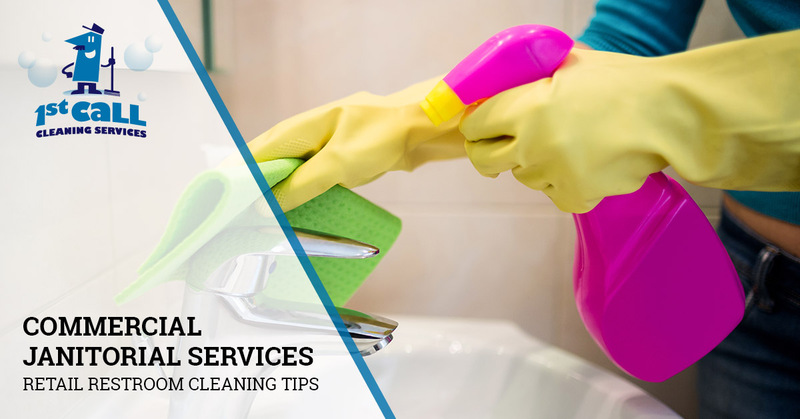 To help keep your retail restrooms spotlessly clean, the cleaning professionals at 1st Call Cleaning Services would like to share with you some simple tips. If you are in the San Antonio area and are looking for a reliable and professional cleaning company, give us a call. We are so confident that you will love the janitorial services that we offer our new customers a free 14-day trial. On top of this, we will never require you to sign a contract — if you are not happy with our cleaning services, you’re free to find another cleaning company, no strings attached. This is how we have done it for 17 years, and once you contact us and experience the superior difference of our commercial cleaning, we’re sure you’ll understand. No matter how immaculate or fully stocked your bathroom is, chances are that it alone won’t pull in new customers. So why does it matter? Well, it matters because it can give customers a reason not to buy and not to regularly shop at your store. The bathroom, just like any other part of your showroom should be looked at as an extension of your facility, and this is something that customers will naturally do — they will associate your business with their bathroom experience. Additionally, surveys suggest that a majority of customers report an unpleasant experience when going into a public restroom. Taking the time to make sure you don’t fall into this dirty majority can help differentiate your business and inspire consumers to choose you. As with all commercial cleaning services, to provide the most effective and efficient clean, you need the proper tools. This is certainly true for cleaning retail restrooms. Good cleaning starts with a full-equipped cart or caddy. You want your cart to include all the necessary cloths, disinfecting sprays, brushes, and more, and you want to have plenty of extra supplies in stock for when you start to run low. Deep cleans are an essential part of residential and commercial cleaning. While routine cleaning is important to maintaining a clean facility, equally as important is periodical deep cleans. A few times a year, you should thoroughly scrub and clean all parts of your bathroom. Wash the tiles, the fixtures, and the toilets, and sanitize the floors. Unlike regular cleaning, with deep cleans you want to devote some serious time to each task, ensuring that each area is as clean as it can possibly be. General inspections should be a part of your cleaning routine. For example, as you clean restroom fixtures, take the time to make sure that everything is fully stocked and working properly. The same is true for toilet paper dispensers, holders, toilets, and all other equipment. Don’t simply settle with just disinfecting the surface. Also, have your commercial cleaners check to make sure that nothing needs to be repaired or replaced. To enhance the cleanliness and the appearance of your restroom, consider investing in fixtures and commercial equipment that is designed to be durable, easy to clean, and stylish. Automatic dispensers and high-efficiency hand dryers are a good example of this. They can control the amount of usage as well as reduce the amount of waste and other objects that can quickly dirty up a bathroom. The frustrating thing about commercial bathroom maintenance is that no matter how much you clean your bathroom overnight, there is a chance that by noon it can be totally trashed. It all depends on the customers. This is why it is important to have your employees do routine checks on the bathrooms. Don’t simply wait until a customer brings a situation to your attention. Have your employees, do hourly checks. Whether or not you decide to make them adhere to a cleaning checklist for each quick inspection is up to you. If you are unable to handle all of your commercial janitorial services, hire professionals. If you are looking for a reliable and professional cleaning company in San Antonio, we can help! We are a commercial cleaning company capable of handling office cleaning, retail store cleaning, hospital janitorial services, porter services, and much more. Learn more about us and contact us today to get started with your free 14-day trial.